[S3876] US State Census for New York State, "New York State Archives; Albany, New York; State Population Census Schedules, 1925; Election District: 05; Assembly District: 04; City: Rochester Ward 03; County: Monroe; Page: 7." [S3877] Kyle Lascurettes, Tree, 2019 "unknown cd." [S2117] Website Family Search (https://familysearch.org) ""New York, New York City Municipal Deaths, 1795-1949." Database. FamilySearch. http://FamilySearch.org : 14 June 2016. New York Municipal Archives, New York." [S880] Website Ancestry (www.ancestry.co.uk) "Ancestry.com. U.S., Find A Grave Index, 1600s-Current [database on-line]. Provo, UT, USA: Ancestry.com Operations, Inc., 2012. Original data: Find A Grave. Find A Grave. http://www.findagrave.com/cgi-bin/fg.cgi." [S880] Website Ancestry (www.ancestry.co.uk) "Parish: Renfrew; ED: 9A; Page: 2; Line: 1; Roll: cssct1881_177." Ancestry.com. California, Marriage Records from Select Counties, 1850-1941 [database on-line]. Provo, UT, USA: Ancestry.com Operations, Inc., 2014. Original data: Marriage records, select counties and years. California State Archives, Sacramento, California." Original data: United States, Selective Service System. World War I Selective Service System Draft Registration Cards, 1917-1918. Washington, D.C.: National Archives and Records Administration. M1509, 4,582 rolls. Imaged from Family History Library microfilm." Original data: State of California. California Birth Index, 1905-1995. Sacramento, CA, USA: State of California Department of Health Services, Center for Health Statistics." Original data: Social Security Administration. Social Security Death Index, Master File. Social Security Administration." [S1108] John Burgess, "John Deam Family History." [S72] UK National Census for 1891 for UK, "RG12/2903 f88a p40 264." 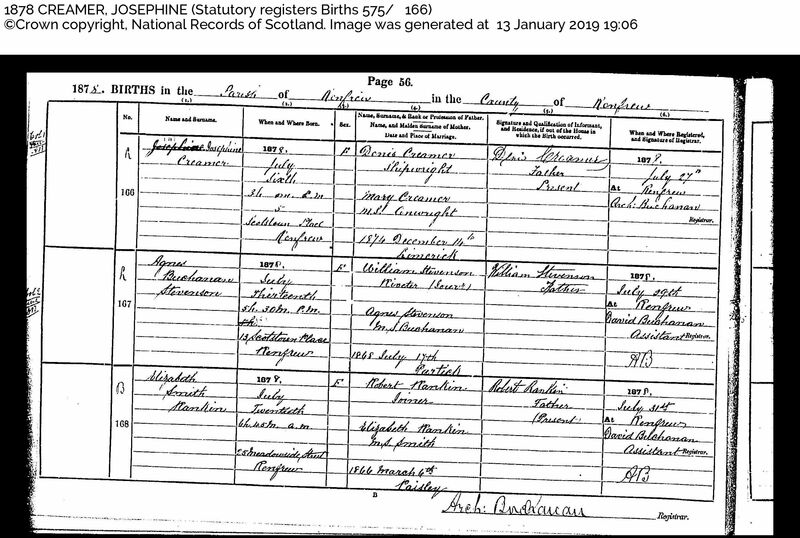 [S704] UK National Census for 1901 for UK, "RG13/3473 f63a p66 444." [S45] Website FreeBMD (http://freebmd.rootsweb.com/) "Births Jun 1882 Blundell Elizabeth Liverpool 8b 140." [S1051] Website Lancashire BMD (http://lancashirebmd.org.uk/) "Liverpool : 2013WD/20/42." [S2272] William Crosbie, Tree, 2009 "unknown cd." [S45] Website FreeBMD (http://freebmd.rootsweb.com/) "Births Sep 1884 Blundell Catherine Liverpool 8b 161." [S45] Website FreeBMD (http://freebmd.rootsweb.com/) "Births Jun 1887 Blundell John James Liverpool 8b 18." [S704] UK National Census for 1901 for UK, "RG13/3408 f115a p62 411." [S45] Website FreeBMD (http://freebmd.rootsweb.com/) "Births Dec 1889 Blundell Robert Edward Liverpool 8b 4." [S1051] Website Lancashire BMD (http://lancashirebmd.org.uk/) "Liverpool : 2124WD/1/197." [S1051] Website Lancashire BMD (http://lancashirebmd.org.uk/) "Liverpool : 2124WD/1/142." [S704] UK National Census for 1901 for UK, "RG13/3408 f115a p62 412." [S704] UK National Census for 1901 for UK, "RG13/3408 f116 p63 412." [S2] UK National Census for 1871 for UK, "RG10/3763 f64a p46 229." [S47] UK National Census for 1861 for UK, "RG9/2654 f175 p61 334." [S1110] E-mails from Pam Holcroft to Alan Bennett, unknown period "Frances reckons they were married on 5th April 1890 at St.Paul's Warrington. She was 20 at the time so born about 1870 In St.Helens. Her parents were Edward and Sarah Johnson???????" [S40] UK National Census for 1851 for UK, "HO 107/2194 f543 p10 40." [S2] UK National Census for 1871 for UK, "RG10/3864 f115 p69 377." [S601] UK National Census for 1881 for UK, "RG11/3736 f8a p10 256." [S76] UK National Census for 1841 for UK, "HO 107/516/12 f19 p30." [S45] Website FreeBMD (http://freebmd.rootsweb.com/) "Marriages Dec 1853 Scott Sarah Prescot 8b 776." [S45] Website FreeBMD (http://freebmd.rootsweb.com/) "Marriages Dec 1853 Johnson Edward Prescot 8b 776." [S2] UK National Census for 1871 for UK, "RG10/3864 f115a p70 377." [S601] UK National Census for 1881 for UK, "RG11/3736 f9 p11 256."